The parents will be arraigned on Friday. A California couple was arrested Wednesday after it was discovered their three children were living in squalor. Authorities initially said that the children had been living inside a box for years, but Capt. Trevis Newport with the San Bernardino County Sheriff’s Department later told The Los Angeles Times that the victims weren't confined to the space. "They're homeless," Newport told the Times. "It's a shelter, the shape of a box … nowhere near what it sounded like when it came out." Deputies made the discovery while conducting an area check in Joshua Tree, according to a press release from the San Bernardino County Sheriff’s Department. They found "a travel trailer, which appeared to be abandoned, and a large rectangular box made of plywood on the property," the release reads. "The property had no electricity or running water. 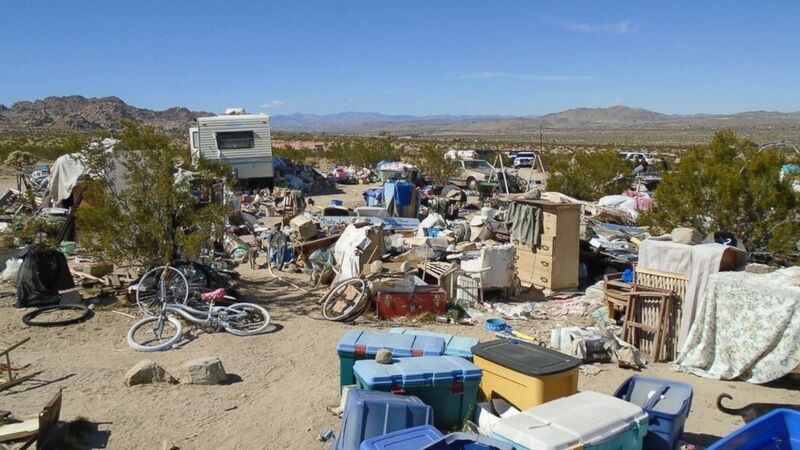 Several large holes and mounds of trash and human feces were located throughout the property." 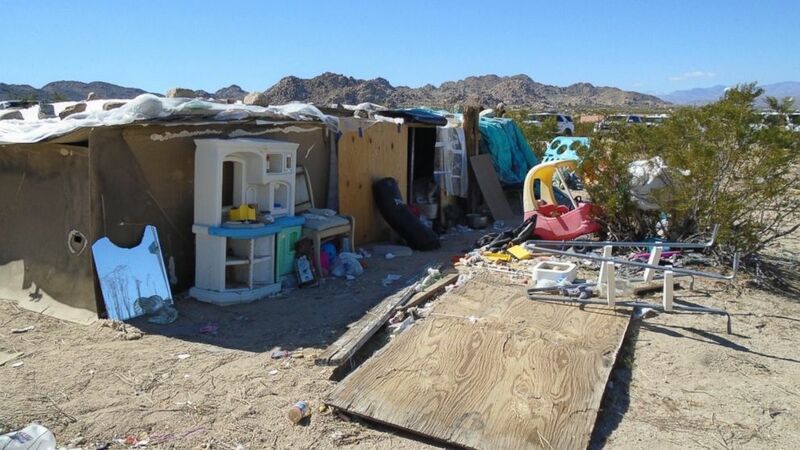 (Morongo Basin Sheriff Station) Authorities in Joshua Tree, Calif., arrested the parents of three children who lived in a box amid squalor for four years on Feb. 28, 2018. Authorities said 30 to 40 cats were found roaming the property, as well. While there, deputies encountered three children, ages 11, 13 and 14, according to the release. "The victims were found to have an inadequate amount of food and were living in an unsuitable and unsafe environment due to the conditions located on the property," the release reads. Two individuals identified by authorities as the children's parents -- Mona Kirk, 51, and Daniel Panico, 73 -- were taken into custody on suspicion of willful cruelty to a child, according to the release. The children were placed in the care of Children and Family Services. Kirk and Panico were later charged with three felony counts of child abuse, and the couple was arraigned at Joshua Tree Superior Court on Friday afternoon, according to the district attorney's office. They pleaded not guilty, according to a reporter for local ABC station KABC. A number of friends and neighbors spoke to reporters at the court, saying the couple are not criminals but rather just homeless. The children built the fort and were proud of it, they said, KABC reported, adding that the children seemed happy. The parents are being held on $100,000 bail, according to the sheriff's department. Anyone with information is asked to call San Bernardino County Sheriff's Department Morongo Basin Station at 760-366-4175.